@anamorphic I added an "Artist" column to the middle pane [in addition to the "Album" and "Date" columns]. Now, those two albums each have their own separate entries. This might only help for purposes of display? i.e. I use the IPod plugin, here, and noticed that I am having the same issue on my IPOD, one entry for both albums in Album view. I posted a similar question in that forum. Do you know anything about this? 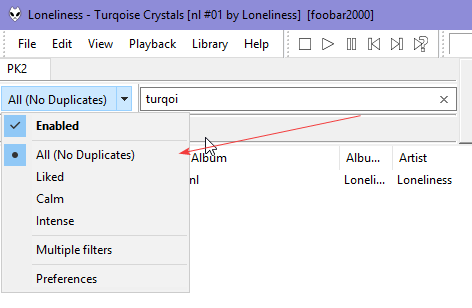 Sorry - I'm not familiar with how iDevices do anything, but it might recognize "Album Title Sort Order" / ALBUMSORTORDER tag (if foobar maps correctly to 'soal' as referenced for iTunes here) - if you want to try that method in my previous post. I have two instances of facets in separate UI elements, can anyone tell me how to make a selection in one instance affect another? Say I chose an artist in the first instance, it would show the artists albums in the second. EDIT* I figure out I just had to set my album list element to playlist instead of library. If I could assign keyboard shortcuts to each of those filters, it would be fantastic! (I would expect the keyboard shortcut to switch between them when multiple filters is off, and apply / unapply them when multiple filters is on). So is there currently any way to cache the album art with facets? I saw a few pages back that there was an alternative using jscript, but it's not for Facets. Facets pretty much works perfectly for what I do. If it can cache the album art, it would be perfect. Does anybody know if there are keyboard shortcuts to switch between filters? I'm on the brink of resorting to pyautogui, I really want a way to do this. PyAutoGUI doesn't work on multiple monitors so I gave up and used autohotkey.